Welcome to the October issue! Whew! What a month October has been! Between video biography production, speaking engagements, and preparing my workshop presentations for the 2016 Association of Personal Historians conference in Ft. Worth, Texas, I’ve had no time for the newsletter. Until today! And I’m glad I have the opportunity to write a few lines, because I want to tell you about a wonderful woman I met before a recent speaking gig. 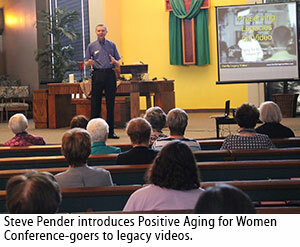 It was Thursday morning, October 13, the day of the annual Positive Aging for Women conference, in Tucson, Arizona. I’d arrived about an hour before my 11 AM presentation to give myself plenty of time to set up my laptop, projector, screen and audio speaker and to make sure everything was working correctly. Then I settled into a front pew in the spacious sanctuary of St. Paul’s United Methodist Church to wait for my audience to arrive. I thanked her. Then, without prompting from me, she began talking about her son. He’d died over two years ago, she said, and left her several videos. She described how the videos continued to give her great comfort. I let her know I understood, and related how the video biography I created about my grandmother in 1998 still brings comfort and joy to my family. It was then she confided that her son had committed suicide, and that the videos were a final act of love on his part, and contained the thoughts and feelings he wanted to share with her. I sat and listened, amazed that she could talk so calmly about such a tragedy, and flattered that she felt comfortable enough to share her story with me. As if on cue, the side door to the sanctuary opened, and my audience of senior ladies began to fill the room. I wished Barbara well and took my place at the front of the room. The presentation was well-received, and as audience members approached me for business cards and brochures, Barbara passed by. “You can use my story for whatever you’d like,” she said, smiling. So here I am, taking a few minutes to do just that. And, you know, I think Barbara gets it – she understands the need to preserve, celebrate, and share her life story before it’s too late. Like her, I think I’d enjoy attending my own wake, too.